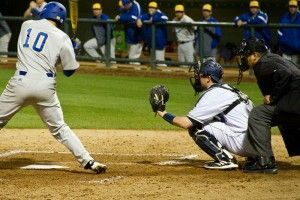 Just three weeks into last year’s season in the series opener against BYU at Anteater Ballpark, then-fourth-year Ronnie Shaeffer reached first base in his first at bat of the game after being walked by starter Chris Capper. In an attempt to pick off Shaeffer, Capper sent the UC Irvine catcher diving back to first. Shaeffer, dirtied on the dive, felt a sharp pain in his right pinky finger as his hand violently collided with the bag. Unknown to Shaeffer and the ’Eaters at the time, the fateful collision would take him out of the game and the remainder of the season. Initially, Shaeffer thought the finger might be dislocated, but after the athletic trainer was unable to set the finger straight, Shaeffer and his family immediately made plans to address the injury in hopes of preserving the senior’s final season. In just a week’s time, the catcher had x-rays, visited a specialist and had a surgery scheduled for the end of that week. The spiral fracture required a number of pins to stabilize the finger, and the catcher was fashioned with a cast the length of his forearm. Post-surgery, the unrelenting Shaeffer did everything possible to remain in the kind of shape a Division I athlete must maintain in order to perform at such a competitive level, while making sure to protect his healing hand. Having been told that he could expect to be cleared in about six weeks, Shaeffer continued to do what he could in the weight room, in addition to hitting in the cage with just his left hand and standing in on pitchers’ bullpens. Even with physical therapy and taking all precautions to ensure a safe recovery, it became evident that the injury was going to take longer to heal than the previously expected six weeks. The senior’s season was over. For a player who says he loves his position because “when you’re catching you’re in every pitch, you’re in all of the action,” it was difficult to imagine not playing at all after coming off of a junior season where he hit .264 on the year and posted 55 hits with six doubles, a homerun and 31 RBI. 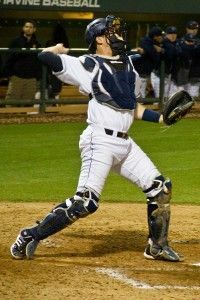 Known for his ability to gun a man out at second, Shaeffer led all catchers across the nation in 2011 as he held the opposing team to just a 43 percent success rate in stolen bases. Then, in his much-anticipated fourth year season, the 2011 American Baseball Coaches Association Gold Glove winner would trade his spot in the starting lineup for a medical redshirt. In light of the situation, the catcher gracefully swallowed the news that he would not stand with his fellow seniors at the last home game of the season to celebrate their collegiate careers at UCI. Undeterred, Shaeffer suited up at every game and began contributing in any way that he could outside of taking the field with his teammates. As such an integral part of the team both defensively and offensively, the ’Eaters were forced to make adjustments to their line-up, giving freshmen Chris Rabago and Jerry McClanahan more time behind the plate. While things changed dramatically for Shaeffer on the field, the injury also greatly affected the senior’s academic career. 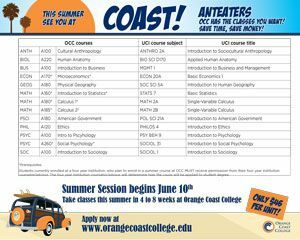 With just a single class needed in spring quarter to complete his business economics major, the Big West Scholar Athlete began searching for options to remain a fifth. After exercising potential options to enroll as a graduate student at UCI, the mathematics-minded infielder decided to take on a second major in anthropology, a field he would have never expected to study. Taking everything in stride, Shaeffer graduated that June from the School of Social Sciences, walked with his teammates and began to prepare for another go-around as an ’Eater. Having been officially cleared to play the week following the end of UCI’s season, Shaeffer spent the summer slowly gaining back the strength in his right hand. With a batting cage in his backyard that his father built while he was in high school, the fifth-year took to the cage, hit off the tee and started with short tosses to ease back into the game that he loves. With his parents as his motivation, Shaeffer thought about his mother and father throughout the process of rehabilitation. Despite a stunted season his fourth year as an ’Eater, now in his final season in the blue pinstripes, Shaeffer is picking up right where he left off and is giving everything that he has to give on the field. He’s back to delivering and coming up clutch — just as he did when he knocked in the walk off game-winner in the UCLA regional in 2011 that took the Bruins out of post-season play. He is back to being the student athlete who was honored with a Lowe’s Senior CLASS Award Nomination in 2012, and is back to being the kind of athlete who has already garnered a Big West Player of the Week recognition in 2013. On Feb. 25 of this year, Shaeffer batted .474 in four games and was responsible for a game-winning RBI and a game-winning run over Cal, leading to his Big West recognition. Shaeffer is currently hitting for a .375 average in 64 at-bats with a .500 slugging percentage and a .388 on-base percentage. The catcher already has two jacks on the season with two doubles and 15 RBI. While just a year ago the catcher had a very different vision of his 2013, Shaeffer looks at this year as a gift — as his second chance. The positive Shaeffer, who not once spoke poorly of the way his injury played out, is stepping up to the plate for the ’Eaters when and where they need him most, whether it be to drive in game-winners or be in a leadership role as one of the older guys on the squad.